We have had a couple of days of nice weather since we arrived but today isn’t one of them. More on that later. We have managed to get some boat tasks done, full of fuel and water, tested and flushed the water maker, and general cleaning and polishing ( a task even more endless than on land). We have also climbed the lighthouse, walked the beach, watched a playoff game at Harbours Edge, had dinner at Wine Down Sip Sip, taco night at Captain Jack, purchased a Key Lime Pie and fresh bread from Vernon, walked to On da Beach for lunch, and attended a light house meet and greet. 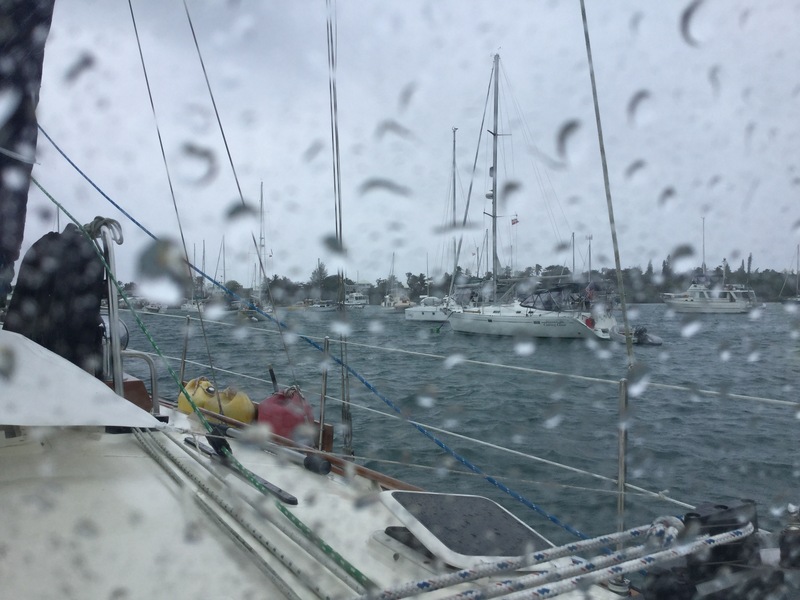 Our friends on Heeling Time arrived last night around 5 after a direct trip across the Gulf Stream, Bahama Banks, past Green Turtle, thru the Whale, thru Customs and then here, a bit tired. So then we dragged them off to a very well attended cruisers pot luck on shore. I’m sure they slept well last night. The weather forecast for the next couple of days is a bit bleak, squalls today with gust to maybe 60, but steady wind now at 20-25 increasing to 30-35 before diminishing on Sunday. We are on a secure mooring in a protected harbor, so with a little luck we will avoid any real excitement. Here’s a view from the cockpit of the Harbor. Peggy is scheduled to return to Onward tomorrow and with a bit of luck we will move south on Sunday. A pretty optimistic plan, but we will see if the weather forecast holds. If all goes well we could be at the Exuma Park by Wednesday.